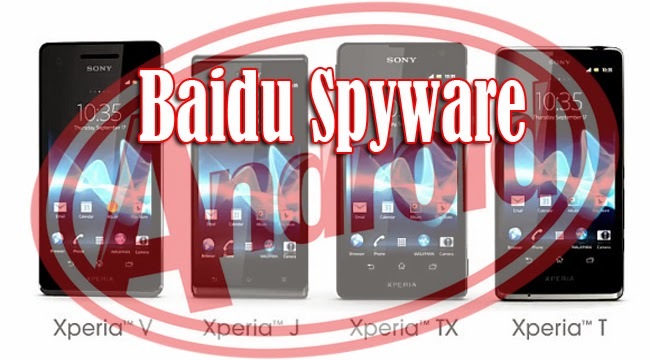 Alleged Baidu spyware is believed to be sending personal data of Sony Xperia users straight to Beijing without even notifying the user. In the official site of Sony’ support room, many had shared their frustrations over a folder named ‘Baidu’ that had been keeping on appearing on their Xperia phones despite being deleted a couple of times. Users of Sony Xperia Smartphones with Android 4.4.2 or 4.4.4 KitKat versions had reported that the folder seemed suspicious as it keeps appearing in their smartphones everytime they delete it and then go online afterwards. A Reddit user even said that he had just unboxed hos new Sony Z3 and he is yet to install apps when he discovered that it is connecting to China. He even wrote in Sony’s support room that he is not worried about the folder itself, but he is seriously concerned that his phone is constantly connected to a link in Beijing. There are some reports that the folder sends pings to China, making people think that that the Baidu folder sends private information to the Chinese government without consent. Sony believes that an update will be able to address the issue and admits that the Baidu’s push notification system is having an unusual behavior. Xperia is supported by both Google Cloud Messaging and as for the users based on China they have Baidu Push Notification framework. Many posted their concerns that the folder could be sending private data to China. They are not happy with the fact that they want the freedom to choose if the folder will stay or not, however, it keeps on coming back to their smartphones after deleting it.